180° Protractor. Compass attached with a lead pencil. Alphabet & Numbers stencil. Set includes 45° and 60° Set Squares. We are committed to provide good quality products. 180 Degree Protractor. NORIS CLUB MATH SET. Self Centring Compass. 15cm / 150mm (6") Rule. Letter Stencil. Comprehensive 10 Piece Set. Each Set Contains the Following. Includes a 10mm lettering stencil with English lower and upper case alphabet letters from A-Z and numbers from 0-9 and a chemistry stencil. 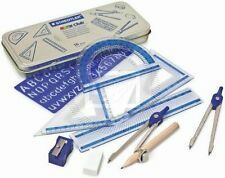 Consists Of: Compass, Rubber, Protractor, Ruler, Triangle. Functions: Drawing Tools. All pictures are for illustration purpose only and Colours may vary slightly. You can follow below process to chontact us. Color: As shown in the picture. Import Duties. 100% New High quality. This product USES 2mm copper plate fine polishing and polishing the whole process, the whole design is beautiful and simple, the work is fine, the scale is clear, durable. Material: brass. Note: Light shooting and different displays may cause the color of the item in the picture a little different from the real thing. 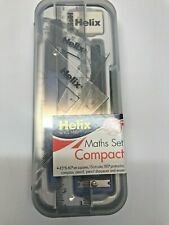 This fantastic Helix Value Maths set contains everything you need for mathematic studies. 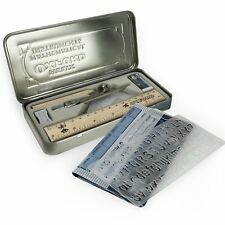 Contains: Compass, 2 set squares, 180 Protractor, 15cm Ruler, Pencil Sharpener, Eraser and Pencil. Functions: Drawing Tools. All pictures are for illustration purpose only and Colours may vary slightly. You can follow below process to chontact us. Color: As shown in the picture. 100% New High quality. Winter Children Girl Kids Baby Warm Wool Hats Beret Artist Beanie Hat Ski Cap 8C. Cozy Soft Strawberry Pet Dog Cat Bed House Kennel Doggy Cushion Basket Beds 8C. Beactive Brace Acupressure Sciatic Nerve Back Leg Point Knee Relieve Tension 8C. You can follow below process to chontact us. feature: simple and durable. color: as the picture shows. All pictures are for illustration purpose only and Colours may vary slightly. GBP 1.78 114 sold. Functions: Drawing Tools. All pictures are for illustration purpose only and Colours may vary slightly. You can follow below process to chontact us. Color: As shown in the picture. Import Duties. 7 Piece Compass Set, Complete & Accurate. This clear plastic protractor is thick enough, thus they are not easy to snap; With hollow center, the student protractor is easy to grip. Compass and protractor are the good match. 1 x Protractor. Warm notice: if you receive the product and found the screw of compass is loose, do not worry, it is not a quality problem; The loose screw makes it easier for you to turn the pencil lead down; You can tighten the screw after using pencil lead replace divider part. 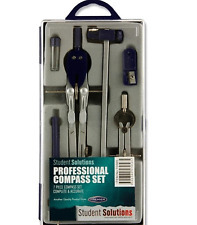 Contains: Compass, 2 set squares, 180 Protractor, 15cm Ruler, Pencil Sharpener, Eraser and Pencil. This fantastic Helix Value Maths set contains everything you need for mathematic studies. Complete & Accurate Mathematical Set. Each Set includes 45° Set Square. 60° Set Square. 180° Protractor. 15cm ruler. Compass attached with lead pencil. 45° and 60° Set Squares. X1 clear pencil case. New and sealed set includes x1 pencil eraser. 1Pc x Math Compass. Especial suitable for school educational use. plastic case for storage and easy to carry. Color: silver. Quantity: 1Pc. Due to the difference between different monitors, the picture may not reflect the actual color of the item. High transparent protractor. The inner ring of the protractor is marked with a 180 degree scale. 180° Protractor. 30 degrees / 60 degrees Triangle ruler has three sides scale. There is a hollow in the middle of the 45 degree triangle ruler. Ideal For Going Back To School Or College. Helix Oxford Student Set 2 Pencils 1 Pen 1 Ruler 1 Eraser 1 Sharpener. Helix Flexible 30cm / 300mm / 12" Ruler Tinted Blue. PERFECT FOR BACK TO SCHOOL, COLLEGE, UNIVERSITY,EXAMS. ALL SUPPLIED IN A TIN BOX. TOP QUALITY SET. SET COMPRISES OF. 60 DEGREE SET SQUARE. 45 DEGREE SET SQUARE. 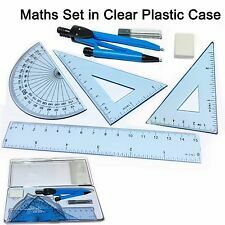 Mathematical set ideal for students featuring pink colour storage tin and eight pieces of stationery inside: a pencil, 180 degree protractor, compass, pencil eraser, 60 degree set square, 45 degree set square, 30cm ruler and a pencil sharpener. Rose Gold Maths Set. Each Maths set contains one white eraser plus one self-centring compass with safety point. Ballpoint Pen. Maths Set & Tin. Good value for money and great for school work. 2 set squares. Can I have my order faster?. 15cm ruler. Gifts for Kids. Gifts for Her. A helpful and compact set to help children with their Maths. 1 x 6" (15cm) ruler. 1 x 3" (7.5cm) right isosceles triangle. We do not under declare values, or mark goods as a "gift". Maths Set in a tin perfect for back to school. Included in the set is 2x Set Squares. 15cm Ruler. 9 piece maths set. Part of the Oxford Helix range. Safety point compass. 1 x Protractor. 1 x Eraser. 2 x Set squares. Eraser & Pencil. Pencil Sharpener.